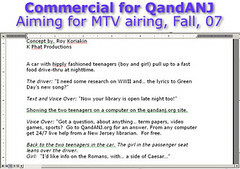 Pop Goes the Library: QandANJ Commercial: Rock Out, SJRLC! This is so fantastic, I almost have no words. A virtual reference ad, on MTV. Your eyes do not deceive you. I am so proud to be a member (or is it my library that's a member?) of the South Jersey Regional Library Cooperative. Talk about getting it. Pete, Karen, Beth -- please post in the comments about how this came about! Will you also have the commercial available on YouTube for those of us without cable to see? Despite what I wrote in my post, I really can't see re-subscribing to cable just to see the ad.